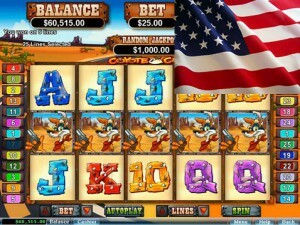 Although Coyote Cash is a bit hilarious at first sight, don't get be fooled-it has surprised many players. This 5 reels, 3 rows, 25 lines slot machine which is available for American players as well, capable of many things. It's enough to take a look at the paytable the high instant wins and the special features catch the attention. First of all, there is the COYOTE CASH wild symbol which helps almost all the time and doubles our winnings. This can replace all symbols except for the FREE SPINS symbol and doubles our current prize. It's not a secret that sometimes these symbols can worth a lot. It has happened several times that lucky player has hit 5 same symbols! However, all casino players know that we can win much more if FREE SPINS symbols appear. 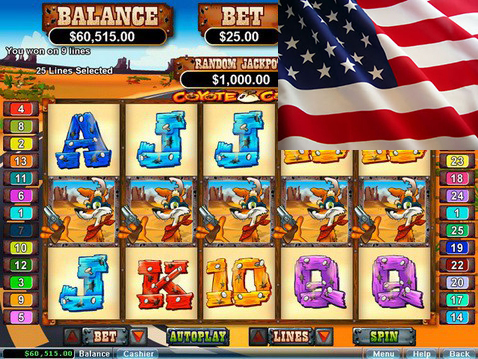 3 FREE SPINS symbols have to appear on the reels on Coyote Cash slot machine. Then we get 20 free rounds with a 2x multiplier promptly. We can check the remaining spins below the Coyote Cash sign. If this isn't enough, there is the chance of winning the jackpot. We can win it at any RANDOM time and it will be credited on our balance immediately. It must be a surprise to have thousands or ten thousands euros winnings. You know, normally i would say . maybe. But the other day I went to a cansio and I played in the deepest part, the last slot machine, I felt so lonely, but every time I made it spin I won, 20 dollars, 50, 5, I ended up making 208 lol but the machine kept giving me win after win after win, and it was the very last, it was dark and lonely . It matches what he is saying, but some lady around themiddle area of the cansio made 5000 jackpot so yeah.